Imprisoned in Arkham Asylum, the Joker has been jotting his deranged thoughts in a journal that is, until the book was confiscated by the orderlies. That s where you come in! 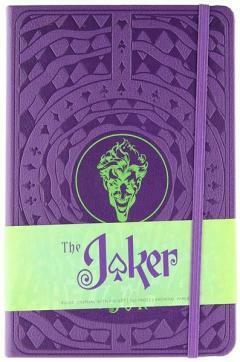 This ruled journal contains several pages of notes and sketches created by the Joker, before giving way to blank ruled pages on which you can jot your own notes. Atmospheric, engrossing, and designed with a dynamic in-universe aesthetic, this journal lets readers feel like part of the Joker s world!